Dissatisfied with the services being provided by the Township of Blooming Grove, five residents of the area – Ernie Ferchland, Ray Owen, Ed Rothman, Walter Simon and Justin Waterman – met in Ernie’s Trading Post to discuss secession from the Township of Blooming Grove. With a $300 retainer, they secured legal service regarding the process. Community meetings were held over a span of five months and, in spite of opposition, a referendum to secede was passed (241 to 171) on August 29, 1938. Incorporation papers were signed on September 1, 1938. Monona Village comprised an area of 1.75 sq. miles with 350 families, a population of 1100, and an assessed evaluation of $1.5 million. It also contained seven miles of waterfront, fourteen miles of local streets, 3.5 miles of state highway, five bridges, three school districts and eight park areas. Justin Waterman was elected the first village president. 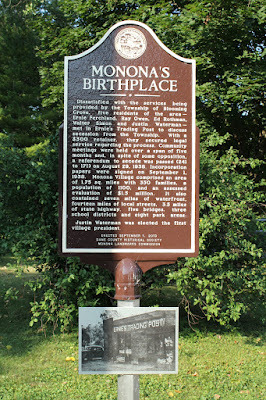 NOTE: This is a two-sided marker; see also Monona's History. The marker is located at the V-intersection of Winnequah Road and Midmoor Road, Monona, Wisconsin 53716. This marker is included in the Dane County Historical Society Markers Series. See also, Ernie's Trading Post 1925, also at this location. With the Ernie's Trading Post 1925 marker to the right. This is a two-sided marker; see also Monona's History. The marker is located in Monona, Wisconsin.